Gold has spent the last couple of days oscillating following its little correction. Bullish spread trading clients have been attracted into buying at these levels no doubt expecting a retest of $1800 and at the time of writing we're at $1766. The precious metal probably needs a trigger to get back up there, rather like the trigger mentioned above that would send indices lower if it came. As a result, all eyes will be on the progress with today's votes in Italy so see if that's the trigger that will spark the next bout of volatility. Brent has also been clawing back some of the mild losses of recent days, which broke out to the upside earlier this week causing many bulls to get excited that this was the next leg higher. For now the bulls are biding their time with Brent trading just higher at $114.10. Even though gold is considered to be a safe haven it hasn't managed to capitalise on the recent turmoil within the markets. Rejecting $1800 only a couple of days ago has seen it retrace back to $1760 at the time of writing. The uptrend remains in tact and so bulls are probably sitting on the sidelines waiting to dip back in again as this little bout of weakness could present them a buying opportunity. Crude oil prices have also suffered selling in line with the risk off trade of the past few days. Just when crude oil looked like it had made a little breakout to the upside, the market turns negative again. This has shown that any traders who've been opposing any recent rallies and falls would have done rather well, as markets have stuck within a relatively narrow trading range. This morning Brent is at $112.40. Investors didn't seem to pay attention to the fact that gold broke the psychologically important level of $1800.0, not reached since Sept 21st, in yesterday's session. The precious metal actually ended the day down $8.7 at $1786.8 after Italy, the newest member of the EU to find itself struggling in the current economic climate, was perceived as being solvent but having liquidity issues. Now that the Italian Prime Minister has announced he will step down, it looks as though investors think there will be less uncertainty and therefore are booking profits in gold, allowing them to dip into riskier assets. The US dollar was out of favour yesterday as risk-on trading was the day's leader. Traders were in search for higher-yielding assets like equities and commodities, where crude oil is at the top of the list. Fundamentally, the need for crude oil in the US has slumped recently but on the other hand a decline in supply has been reported, bringing support back. Iranian issues were also back on the agenda, threatening to disrupt supplies, as a leaked report indicated that the International Atomic Energy Agency is about to accuse the Middle Eastern country of running a nuclear weapons program. Since the 6th September, the gold market has seen 20% erased from its price after investors have sought new safety havens and banked profits from the precious metal. This slump ended on the 25th and now a recovery path is being formed once more. Yesterday's session saw the metal's safety haven status return as a $30 rally took place, bringing the yellow brick up to $1794.5. The dominating reason behind this hike was the concern that Italy isn't far off from joining Greece in the dog house after reporting that borrowing costs were at all time highs. At time of writing the shiny metal is having a breather and trading down at $1787.9. Despite the limited gains in the equity markets and the small increase in the US dollar, crude oil prices furthered their gains during yesterday's trading. One would look at the black gold's trading and assume that it is more driven by the resilient US economy, as opposed to the faltering Eurozone. With technical analysis supporting the rally, peripheral investors may be waiting to get involved once key upside levels have been reached. Brent currently sits at $115.39. The risk off trade is helping push gold higher to $1767, just off its highs of the morning. The precious metal has had a good week or so, having attracted buyers ever since dipping back towards $1600 at the end of October. Gradually, slowly but surely the precious metal has got itself within touching distance of $1800 again. The bulls are trying to re-establish the upward trend and seem to be making a good fist of it. Our spread trading account holders remain bullish of the metal and would no doubt dearly love a return to the all time highs. Brent crude oil is remarkably flat considering the risk off session in equities. It's off its highs above $113 from the Asian session which has brought it back to $112 at the time of writing, with the black stuff seemingly seeing any major moves to the upside contained. Yesterday's trading session for gold saw it reach highs that haven't been seen since late September, as investors relaxed their concerns that Greece may default, bringing carnage to the European banks. As an alternative investment, the precious metal is increasingly becoming more appealing, with the ECB reporting an unexpected cut in interest rates. Further support was provided by speculation over the Fed pumping out another bout of quantitative easing so, amid a weakening dollar, gold gained $25 to end the session at $1762.8. 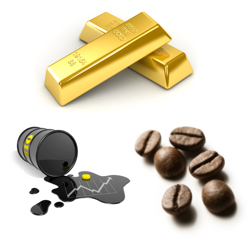 This morning a little bit of profit taking has crept in as the precious metal is at $1757 at the time of writing. The crude oil spreads market was given a leg up yesterday as hopes for a resolution on the Greek crisis were hitting headlines, increasing demand for the black stuff. Additionally, the good news from the US in the form of initial jobless claims dropping more than anticipated gave support to oil, as did the weaker US dollar. Let's just see if the NFP data later today can keep the market optimism high but as of right now, Brent crude is currently trading at $111.09. As the dollar slumped in yesterday's trading, due to hint-dropping by Fed Chairman Ben Bernanke about more stimulus if the economy remains weak, gold made back recently lost ground. Support was also given by the carnage in Europe. All in all the precious metal made a conservative gain of $16 to end at $1736.5, which at time of writing is in the process of being eradicated, as the yellow brick sits at $1729.9. Amid yesterday's concerns on the EU bailout plan, the rise in the ADP employment report was a breath of fresh air. The US private sector added 110,000 jobs last month, beating expectations and spurring on energy traders thoughts of strong demand for crude oil remaining. So in the early afternoon trading, the liquid stuff had a nice little rally, which was wiped off later on as the US Department of Energy report on crude stockpiles showed inventories were higher than initial expectations. At time of writing, Brent is trading at $108.3, down $1.07. Initially, the gold market felt the brunt of the disarray, dropping to as low as $1680.9, but pessimists could not keep it under the $1700.0 mark for long. Bargain hunters stepped in to snap up a deal and traders chose it as a traditional hedge against market mayhem. By the end of the day, the losses had been wiped off and $5 was added onto the starting price, taking it up to $1719.3. This morning the precious metal is seeing further strength to $1735. Risk adverse traders threw their money in to safety havens, the main one being the US dollar. This, in turn, pushed crude oil prices down and a drop in China's PMI manufacturing, the second largest oil consumer, helped put further pressure on the black gold. A late pull back was seen though as better prospects for the US economy were reported, with new orders expected to rise. At time of writing, the black stuff is sitting at $110.31. Thanks to Japan's intervention in the currency market, the US dollar got a shunt, sending in northwards. This opened up a trapdoor for the commodities markets, sending them spiralling down. It seemed the only thing providing support for gold was the 40 day moving average, which stopped it from finishing below the $1714.2 mark, having lost $33. It continues to look as though risk adverse investors are one by one losing their safety havens; after waving goodbye to the Swiss franc and now the Japanese yen, will gold step back in to be a hedging favourite? At time of writing, the precious metal is trading at $1710.0, not far off yesterday's close. MF Global's bankruptcy claim somewhat distorted the trading session for crude oil yesterday, as they were one of the largest commodities brokers out there. After market traders were told they could only liquidate existing positions at the broker, volumes were understandably sent plummeting, below half of average levels it was claimed. So disregarding the slumping equity markets and rising dollar, crude sat pretty much flat. At time of writing though Brent is trading down on the day at $107.91. Friday's session saw the yellow metal close not far from flat, as those trading gold CFDs booked the profits from a five day rally which took the yellow brick from a low of $1611.0 to the highs $1750.0. There were several factors involved in the tug of war for gold. The higher US dollar put downwards pressure on the commodity, making it look more expensive to bargain hunters, whilst uncertainty over the European rescue package provided support as, in the long term, it is likely to spur higher inflation. So after a day of toing and froing, the two opposites discarded each other to mean gold closed at $1743.2, just short of $2 off the open. However, at time of writing, with a second bout of profit banking, gold is down to $1714.6. The excitement born form the grand unveiling of the European bailout plan was certainly short-lived. Pessimism was back on the table on Friday as market participants realised that there were still a lot of unanswered questions and a potential lack of resource to fulfil the plan and stop the possible slump. As a result of this, the US dollar benefited from some buying, which helped to push crude oil prices down. This downward pressure hasn't stopped and at the time of writing, Brent is trading at $109.26.